The Monmouth County Police Chiefs Association is celebrated their 75th Anniversary in March 2015. The Chief’s Association was founded March 14, 1940. 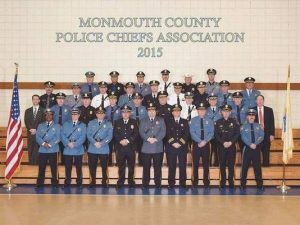 Initially established to standardize police procedures, foster inter-departmental collaboration, and ongoing training, members of the Association, including departments in towns throughout Monmouth County, have not only provided training and leadership for law enforcement personnel, but have also excelled in community outreach and support through a number of local programs for students with an interest in law enforcement. By establishing scholarship programs for college-bound students and providing internships at participating police departments, the Association has been able to provide opportunities in law enforcement for younger members of the communities they serve.